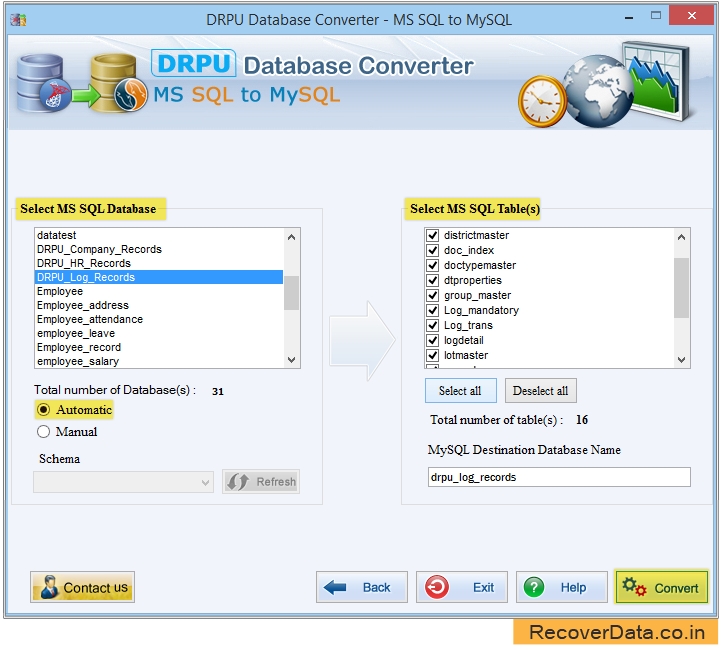 MSSQL to MySQL database converter software converts database records of MSSQL to MySQL database server. 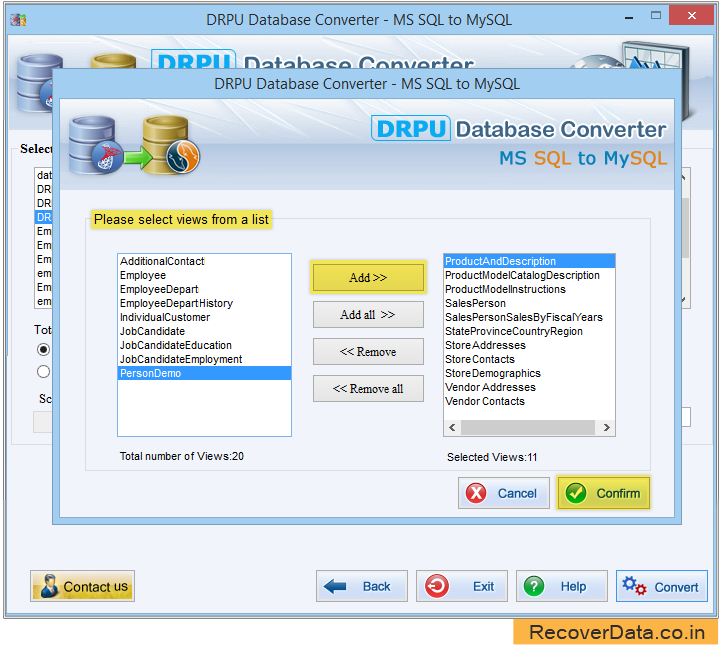 Software allows to converts single database table or entire database table’s records depending on user’s choice from MSSQL to MySQL server. You can easily establish the connection with MS SQL Server and MySQL Server using Windows authentication or SQL server authentication to convert database records. 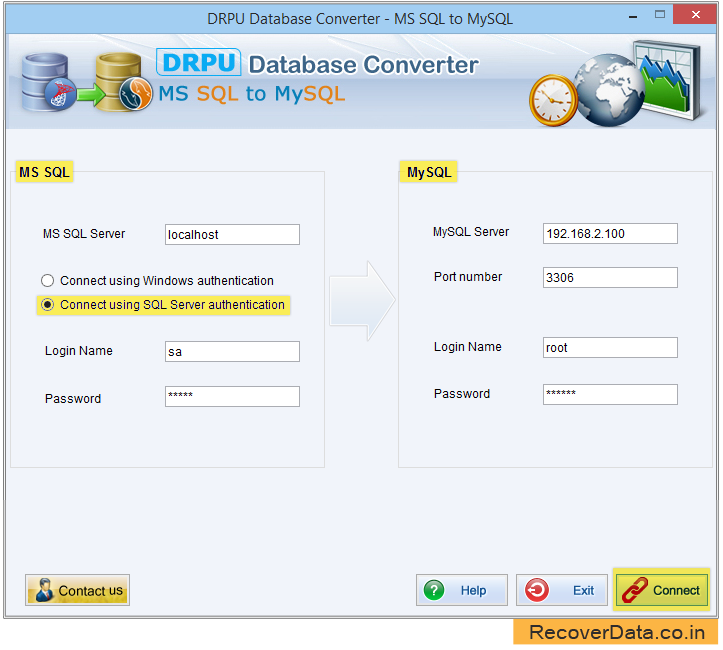 DRPU Database Converter - MS SQL to MySQL Software works with all versions of MS SQL server and MySQL server. Software has option to select schemas automatically or manually. 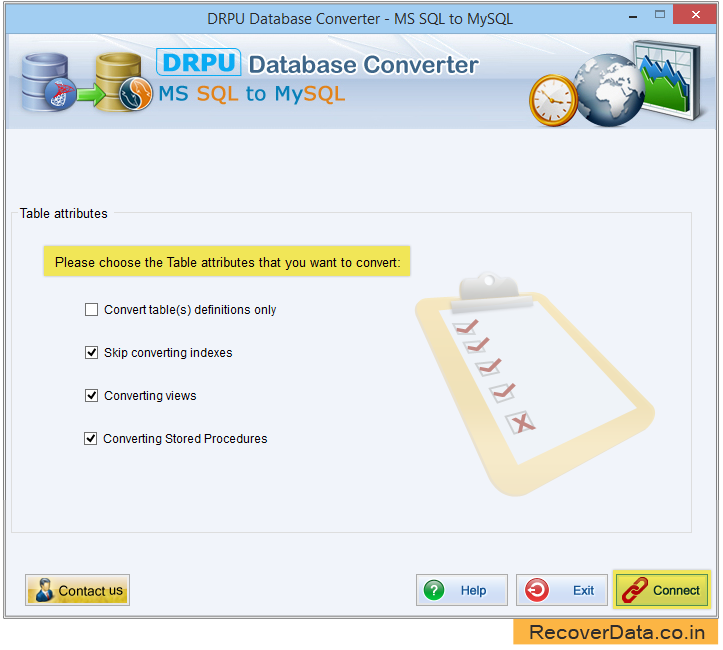 Convert entire or selected MS SQL database table(s). Support all MSSQL data types and attributes. Software easily converts views, indexes with all necessary attributes, stored procedures, queries and foreign keys etc. 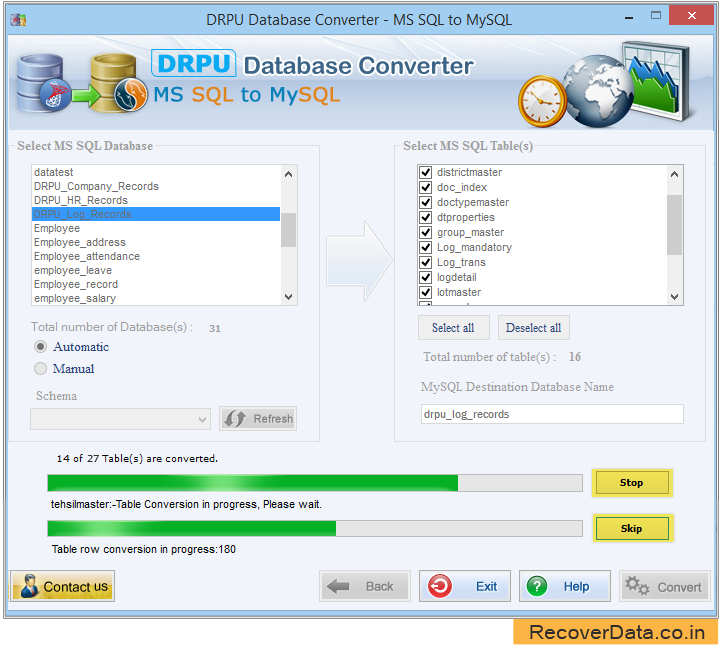 Perform database conversion easily and accurately. Software works with all major versions of MSSQL database server. 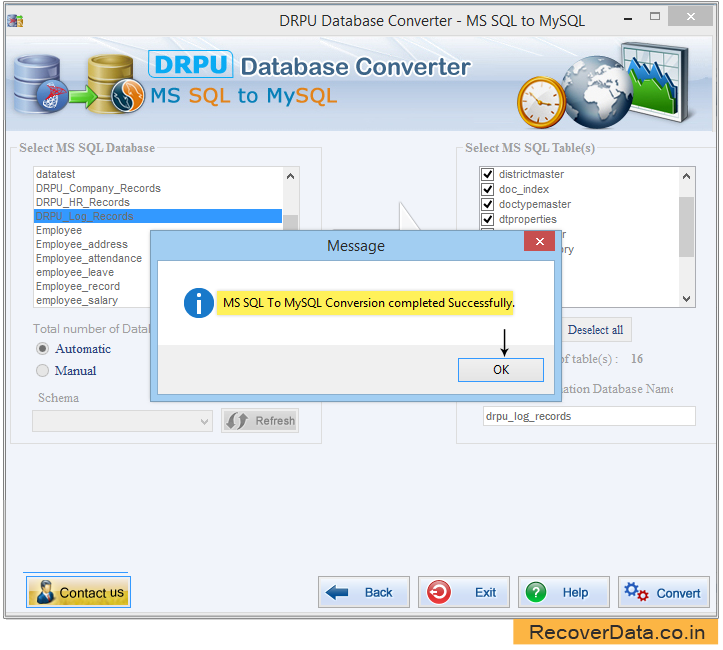 Launch MS SQL to MySQL Database Converter and establish connection with MS SQL server and MySQL server to convert database. If you want to convert only table structure, choose table(s) definitions only. Similarly, you can choose converting views option and skip converting indexes accordingly. 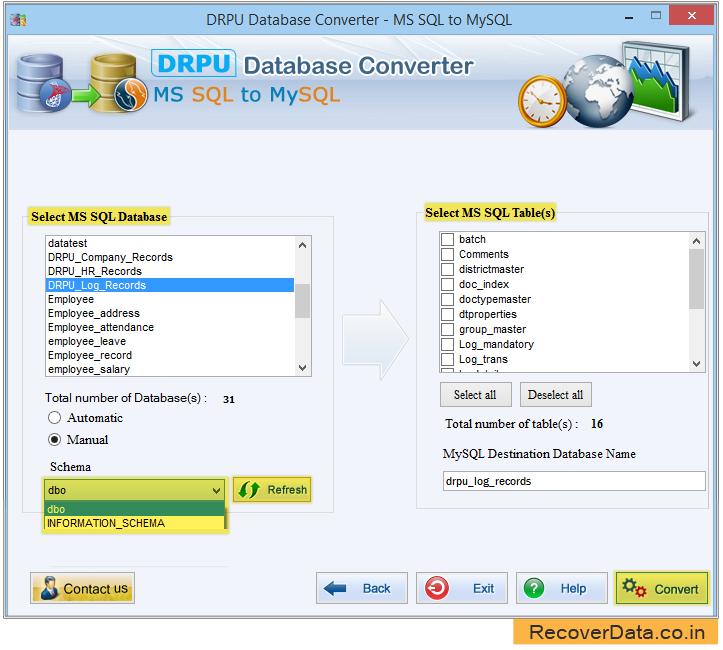 Database converter provides Manual option to select schema manually, choose selected database table(s) to convert it. Here dbo schema selected for demonstration purpose only. In Automatic option, Schemas items are automatically selected with MS SQL database and MS SQL table(s). Select views from a list and click on Confirm button to proceed. Above screen shows the progress of Database conversion process. You may interrupt or skip conversion process with Stop and Skip button, and the converted database records will be save upto that point where the process was aborted. Finally your MS SQL to MySQL database conversion successfully completed.